Relocating, even within a country, brings with it a sense of displacement and wonderment. To be in a new place often makes one aware of the very qualities of place. A sense of home can become quite liquid, even ephemeral. The work presented explores various qualities of place by simultaneously displacing the viewer and giving them fragmented moments of familiarity. When flying above the landscape, perhaps in the very act of relocation, one can see unity, pattern, and rhythm on the surface below. Installation is naturally well suited to foster this sense of immersion. I often consider placing the audience in an aerial perspective, looking down on a landscape. They are both in it, and outside of it, of it and new to it, lost and dazzled. I utilize a background in traditional object making to approach the more socio-ethnographic side of the place/landscape dialog. Image is used more readily in these object-based bodies of work, usually as signifier or symbol for a larger, more political “site” (as described in Miwon Kwon’s One Place After Another). Often symbols of regional sculptural traditions are utilized to carry a discussion about our dynamic and complicated relationship with place. I intend the aesthetic qualities of an installation or object to be piece-specific. This requires a fluid approach towards beauty and a malleable skill set. My work uses humor to disarm, material and craft like a candy, and always seeks to generate questions. Brad Allen holds a MFA from Southern Illinois University—Carbondale and is an Associate Professor in the School of Art at The University of Montana. Brad’s work has been featured in many national juried exhibitions since joining the UM faculty in 2005. These are highlighted by: American Diaspora in New Jersey, Sculpture Invasion in Chicago, and Contemporary Cast Iron II in Memphis. He exhibited a solo installation at the Missoula Art Museum in 2007 entitled LooM: Captive Moon and the Freckled Lake Bed. He often utilizes skills centered on the production of objects and installations, but increasing levels of interest in the still and moving image have spurred a body of action-based documents and paintings. 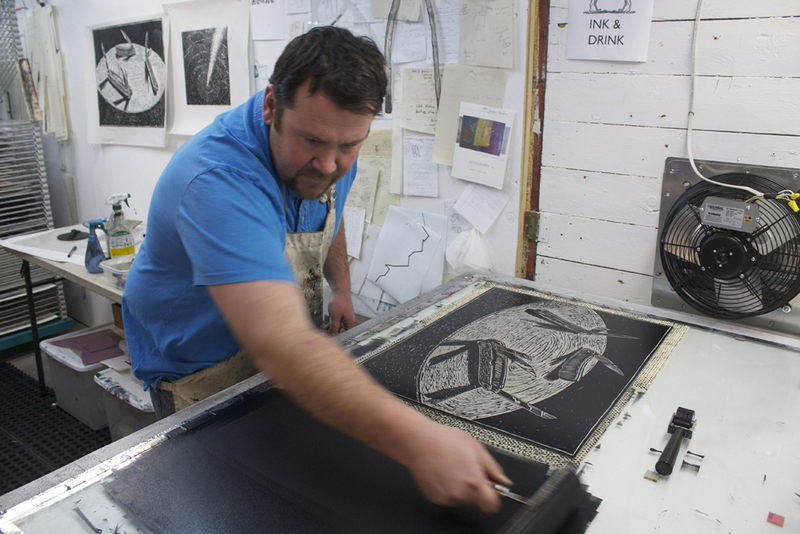 In 2007 Brad co-founded the Western Cast Iron Art Alliance with 8 educators from art institutions in the western states, and in 2010 hosted the 2nd Biennial Western Cast Iron Art Conference in Missoula, MT. Brad has been a panelist or visiting artist at The International Conference on Contemporary Cast Iron Art in Telford, England, The University of Kentucky, Arizona State University, and San Diego State University.